In yesterday's blog post, I mentioned that while on my way to a greenmarket and the green-flea (on the UWS) this past Sunday, I noticed (as did many others, including the police) that a raccoon was looking down (from the tree tops near some scaffolding) on all who passed by. I also mentioned that I was at the market longer than I anticipated, so I never did find out what happened to the creature; for when I returned all evidence of the incident, including on-lookers and policemen were gone. 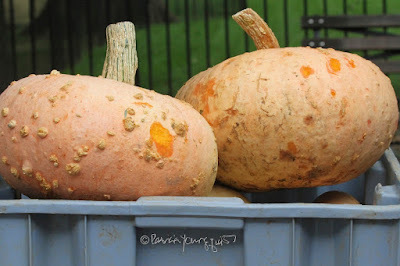 One of the reasons for my tarrying at the greenmarket was that I spotted a pair bumpy looking pumpkins (pictured above) at Gaia's Breath Farm's "vending" stand and took the time to ask about them. I learned from a kind woman working there that these are a variety known as a peanut pumpkins, a term which I immediately googled after putting the one I got atop the urban hedge in my rooftop garden. 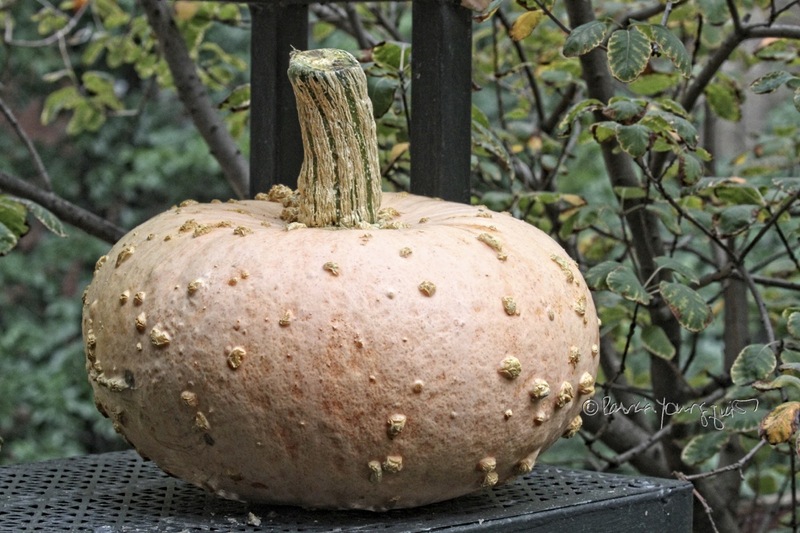 According to a gardening-related web-page, "the peanut pumpkin (Cucurbita maxima ‘Galeux d’Eysine’) is an heirloom pumpkin varietal notable for its distinctive peanut-like growths peppering the exterior of its pink hued rind. Certainly unique looking, some might say unattractive, the 'peanuts' are actually a buildup of excess sugar in the flesh of the pumpkin." I was not surprised to learn that some say the Galeux d’Eysine was "unattractive" because of having peanut-like growths. However, it is the peanut-like growths that drew my attention, because they reminded me of my own lumps and bumps (that I deplore so much that I rarely alllow my picture to be taken, but for purposes of this entry, one is included towards the end) which I have as a result of being born with the medical (neurological) condition, Neurofibromatosis Type-One. These lumps and bumps of mine (I have thousands) have been the source of physical and emotional pain since birth. On a frequent basis total strangers have stopped me on the street to ask why I look the way I do. 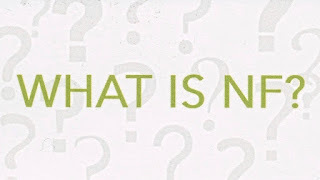 Just this past August, while I was getting a courtesy water at a place on Manhattan's Westside, a young man pointed to the growths on my arms and grimaced, "What is that?" This was hardly an unusual encounter for me, it has been my experience ever since childhood. I explained to him that my bumps were due to my having been born with NF and went on to tell him that the growths that he was seeing were not actually bumps, rather they were tumors wrapped on my nerve endings that pushed through my skin’s surface. The stranger wasn’t particularly interested in my response, and I don’t think he really cared about why I have bumps, rather I think it was a passive form of bullying. But as I said, my encounter with this individual is something I experience frequently, and this recent one caused me to think that the next time it happened, I would take a beat, remove my glasses, and look at my bumps; then I’d say, you are right, I do have bumps! I hadn’t noticed. Thanks for letting me know. 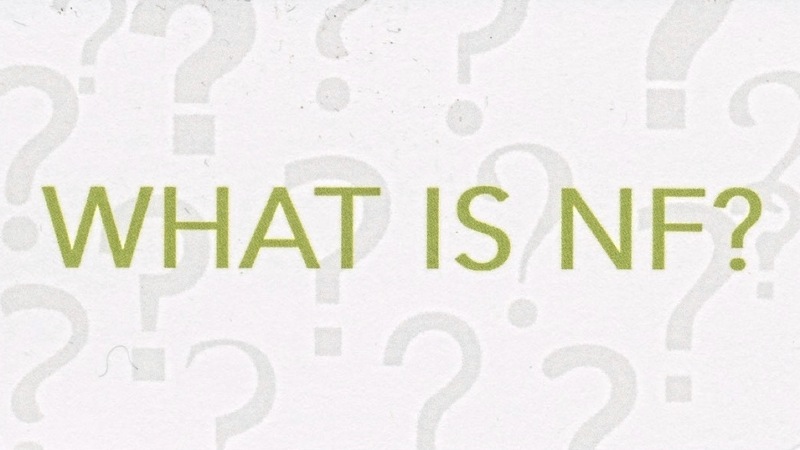 That recent encounter also prompted me to have a small card designed to briefly explain NF (question on the front, brief answer on the back). But getting back to what the aforementioned web-page says regarding the peanut-like growths on the Galeux d’Eysine ... They claim the "peanut pumpkins are more than edible; the flesh is sweet and delicious. These warty protuberances add up to an extremely sweet flesh, suitable for use in desserts such as pies, breads and cheesecakes." How ironic that what is perceived to be unattractive re The Galeux d’Eysine is the very feature which gives the pumpkin so much flavor! The peanut pumpkin isn't the only "product" which farmers have that is considered to be unattractive due to lumps and bumps; this happens with gourds too! At Tucker Square's greenmarket (also located in NYC's UWS) this past Saturday, one of the growers (Ronny from Stokes who sold me my ever-thriving smoke bush nearly thirteen years ago) offered an array of pumpkins as well as gourds. The pink pumpkin to the right of a bumpy yellow gourd (seen in the image directly below) are two examples of what he had. I've seen pink pumpkins in many places over the years and I've also seen bumpy gourds, which is a topic I discussed a number of years (six years — 2012) ago here on Blogger. In that posting, I mentioned that when I inquired about the lumpy/bumpy appearance on some small gourds that another vendor (Pamela Torres who runs Prospect Hill Orchards) at the Tucker Square greenmarket was offering. I learned the bumps/lumps on gourds was not because of "a hideously disfiguring disease that's suddenly stricken one of America's favorite autumn staples – these pumpkins have been genetically engineered to look that way. It takes at least 10 generations of cross-breeding to produce a pumpkin that's adequately covered in warts to be sold under the Super Freak label, according to Roy Pearman, director of sales and marketing for Siegers Seed Co., based in Holland, Mich., which 'puts the genetics together' to create seeds for the bumpy, heavily wart-covered pumpkins and gourds." However, until this past Saturday, I hadn't seen gourd that resembled the yellow gourd represented in my image. 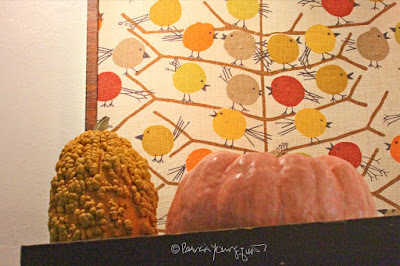 Upon my seeing Ronny's super bumpy gourd, I did some research on "bumpy and lumpy gourds" and one of the things I read was in an article about Adam Pyle (a horticulturalist at the United States Botanic Gardens) which state, "These interesting new gourds, they don't just exist — people make them. And there's nothing new about that: We've been manipulating squash and gourds to suit our various needs for around 8,000 years, when Pyle says people first started breeding them. They're among the earliest plants that humans domesticated. For millennia farmers created new varieties that tasted better, or had tougher skins that enabled them to last through the winter, or resisted disease. And now we're making them as pretty — or ugly — as possible, depending on whom you ask." The words, "... now we're making them as pretty — or ugly — as possible, depending on whom you ask," really struck a chord (particularly the word "ugly"), with me for as I've told you, I am hyper-sensitive to remarks made about lumpy and bumpy appearances; but I am also struck by the words, "depending on whom you ask," for just as there are some who find the peanut-like growths on The Galeux d’Eysine to be unattractive, a baker or gourmet connoisseur values them for the taste they bring to foods. And so it is with the lumps and bumps on gourds! One person will see the growths on the gourds as hideously disfiguring (as Roy Pearman pointed out); another — so says Pyle, the horticulturist whom I mentioned earlier — will see the growths as "aesthetically interesting." Pyle also proclaims, "Everyone wants to have the new, really cool gourd that everyone wants to buy, that Martha Stewart posts on her blog ... You have a huge demand for squash and gourds that are aesthetically interesting and different from each other. 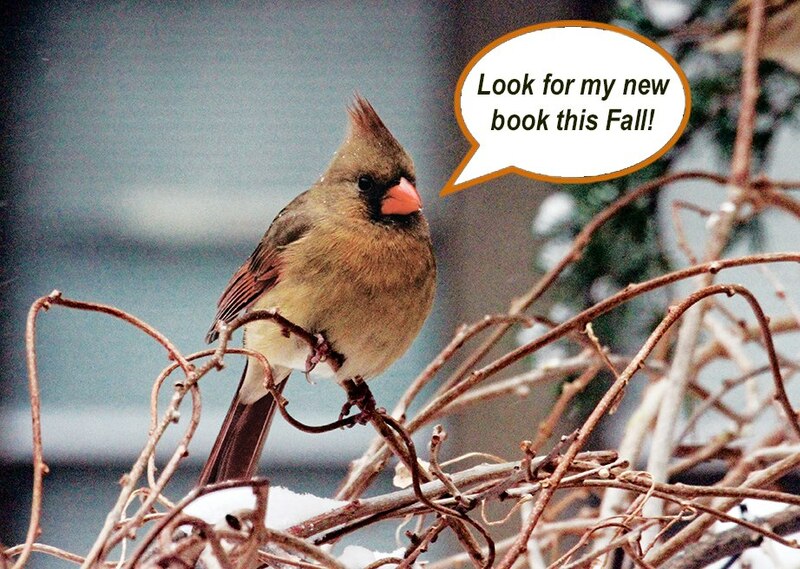 That's been popular for a while, and it's been really trendy the last few years." But the gourds and pumpkins which farmers grow, aren't the only ones to experience disparaging remarks re a lumpy and bumpy appearance, nor am I! and if you look closely, you will surely notice her physical appearance — to a certain extent — resembles my neurofibromas. A web-page for The Cornell Lab of Ornithology states the following: "Muscovy Ducks have red facial skin with odd warty growths." The Muscovy duck's so-called "odd warty growths" (featured in the next image which is from Wiki) are what remind me of my NF-related growths. Another source (also associated with Cornell) calls her type “frankly, gross because her skin is not only red it is quite bumpy..."
I have an advantage over the muscovy in that I can hand out my NF cards to raise awareness as to what's causing my lumps and bumps; but there's not much this duck can do, except to know that there are people who appreciate the muscovy's appearance, including a duck rehabber who has this to say: "Sometimes when people see muscovy ducks they say, 'Eeww! Ugly!' Then I usually say, 'Look who’s talking. 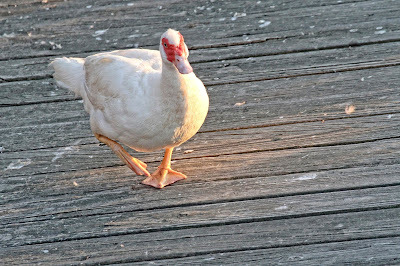 You’re one to judge!,' in response, but that doesn’t make me many friends... It’s true, the muscovy can be an odd duck when you first see one. But once you know all about them, they’re really quite beautiful..."
So just like The Galeux d’Eysine from Gaia's Breath and Ronny's yellow gourd, the description of physical appearance greatly varies, depending on who is talking. 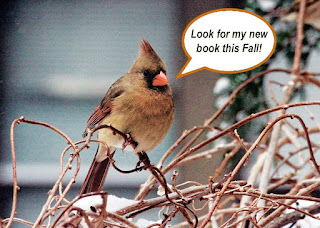 Be that as it may, having NF is something I try not to dwell on; rather, I try and learn a lesson from how the various birds I encounter in my rooftop garden (including — alphabetically— the lone American kestrel, the lone American Goldfinch, American Robins, Emily, the lone Baltimore oriole, Bluejays, Cardinals, Chickadees, Common Grackles, Dark-eyed Juncoes, Downy Woodpeckers, European Starlings, House Finches, House Sparrows, Mourning Doves, Northern Mockingbirds, Pigeons, the lone Red-Tailed Hawk, the lone Rose-Breasted Grosbeak, Tufted Titmouses, and the lone White-Breasted Nuthatch); as well as the ones I've met at Long Beach (such as the American Oystercatcher), and those found in Central Park (such as Canadian Geese, their goslings and a Red-Bellied Woodpecker); and also ones that can be seen along the Hudson River (like the Muscovy) cope with physical appearances which make them vulnerable. 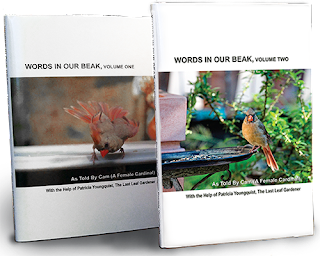 Each bird I meet has a physical difference, making the creature something to cherish and not deem as being "freaky." 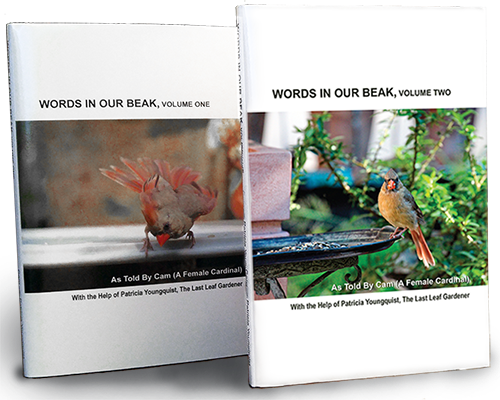 This is evident by the awesome photo-ops of my feathered friends enjoying their surroundings, all of which can be found throughout the volumes of my book series, Words In Our Beak.